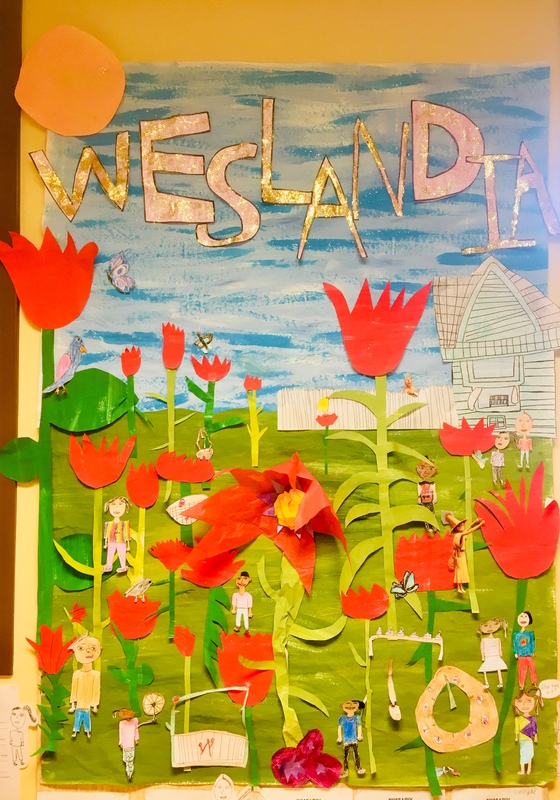 This Storyline is based on the book, Weslandia, by Paul Fleischman. It tells the story of boy who creates his own civilization as an elaborate summer project. After his garden is mysteriously planted magical seeds one night at the beginning of the summer, unknown plants begin to grow. From these plants, he is able to create his own civilization. Students participate in the story as schoolmates of Wesley. They get to experience the story through process drama activities, research, writing activities, etc. 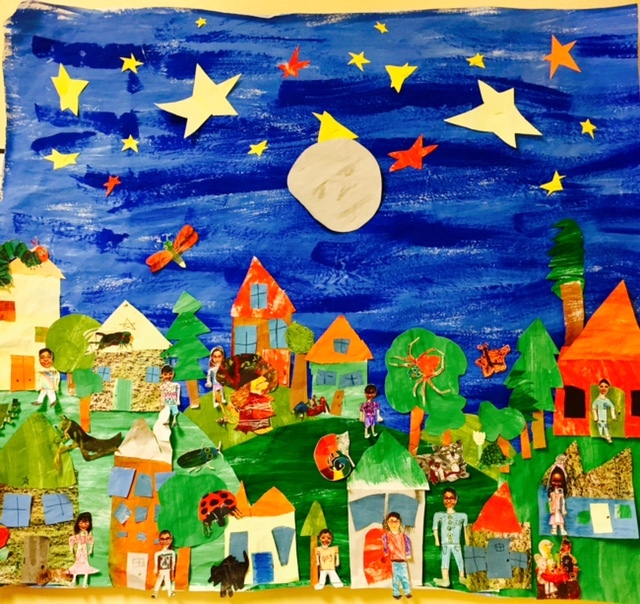 This Storyline was originally written for the regular classroom by Colleen Vallerga. I adapted it for ELD. All 10 ELP standards are included. This entry was posted in Uncategorized on March 18, 2019 by C.Vallerga. 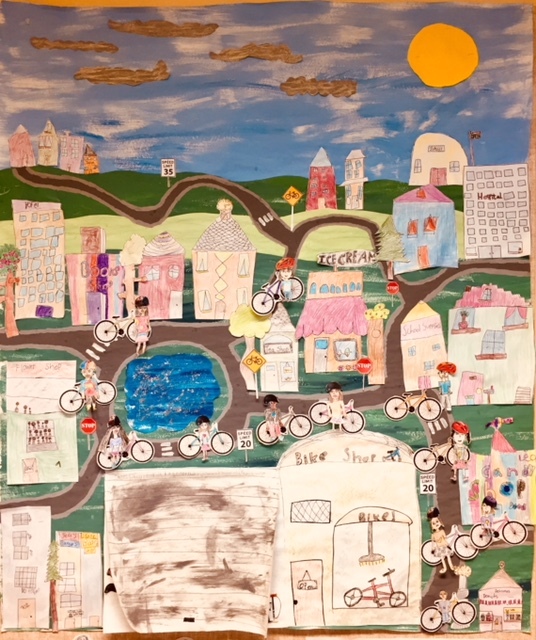 Our last ELD Storyline for the year was based on the book, The Red Bicycle by Jude Isabella. Leo, the main character in the first part of the story, outgrew his beloved bicycle: Big Red. The bike shop owner in his town encourages Leo to donate Big Red to Burkina Faso where bikes are high demand. In Burkina Faso, we meet new characters who love Big Red as much as Leo did. In the first part of the story, the students become friends of Leo’s who are also purchasing and enjoying their first bikes. In the second part, the students use their imaginations to tell important stories about the new lives of their bikes in Africa. Everyone was actively engaged during this Storyline through research, drama and even a bike ride! If you’d like to learn more about this Storyline, come to the International Storyline Conference! This Storyline was written by Colleen Vallerga. I adapted it for ELD. This entry was posted in ELD Storyline, ELD Storyline Example, Frieze, Storyline Planning on June 15, 2018 by C.Vallerga. 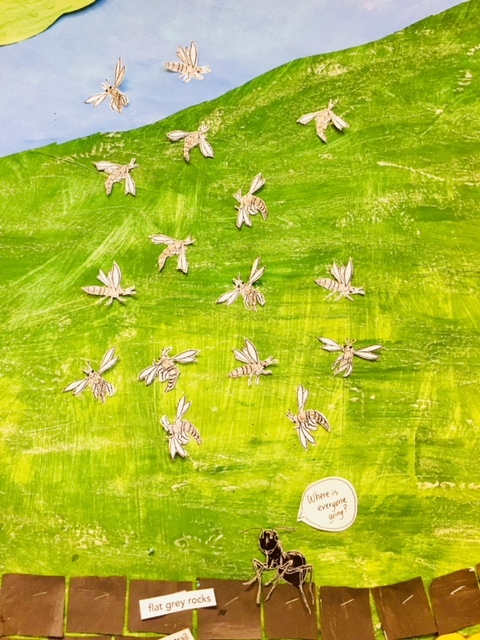 Our most recent ELD Storyline was based on the book, It’s an Ant’s Life by Steve Parker. The students became worker ants in our colony. In role as their characters, the students responded to many incidents. Below you will find a picture of the flood and the swarm. All 10 of Oregon’s ELP standards were included in this Storyline. This entry was posted in ELD Storyline, ELD Storyline Example, ELP Standards & Storyline, Frieze, Storyline Characters on March 24, 2018 by C.Vallerga. –The Big Orange Splot by Daniel Manus Pinkwater. This ELD Storyline is based on the book, The Big Orange Splot by Daniel Manus Pinkwater. Mr. Plumbean, the main character in the book, lives on a street where everything is the same. The students become the neighbors of Mr. Plumbean on this very boring street. One day, Mr. Plumbean has a change of heart and decorates his house in a crazy fashion. His neighbors, while initially upset, follow suit and change their own houses to fit their dreams. 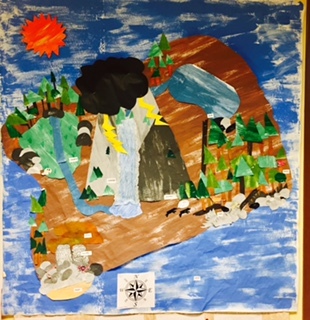 Oregon’s ELP standards are integrated into this ELD Storyline in a fun, engaging way. This entry was posted in ELD Storyline, ELD Storyline Example, ELP Standards & Storyline, Frieze, Storyline Characters on December 12, 2017 by C.Vallerga. We just finished an ELD Storyline is based on the book, How to Make an Apple Pie and see the World by Marjorie Priceman. The main character in the book, whom we’ve named Lucy, decides she wants to make an apple pie. She goes to the market in order to get her ingredients and discovers that it’s closed! Therefore, she decides to travel around the world to collect the freshest possible ingredients for her pie. 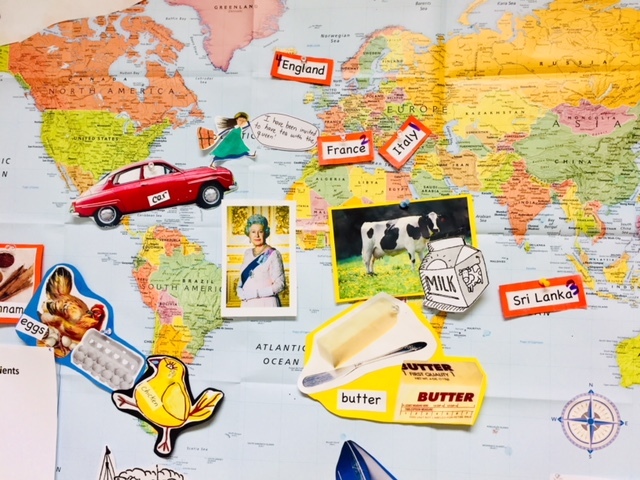 Upon Lucy’s request (and a promise of some delicious apple pie at the end), the students become travel agent characters in order to assist her on journey. Once Lucy finishes her trip, she mails her travel agents some apple pie in order to thank them for all their hard work. This entry was posted in ELD Storyline, ELD Storyline Example, ELP Standards & Storyline, Frieze, Storyline Characters, Uncategorized on November 9, 2017 by C.Vallerga. 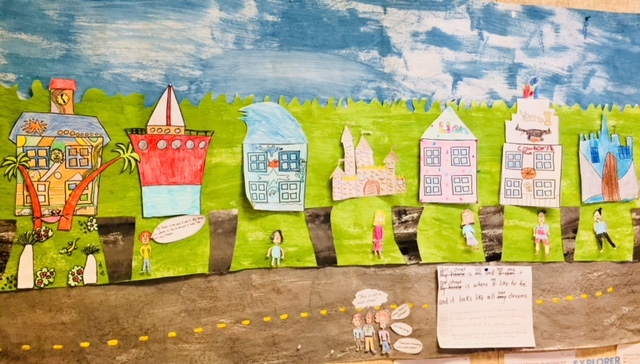 Grades K-2 did an ELD Eric Carl Storyline based on the stories of Eric Carl. 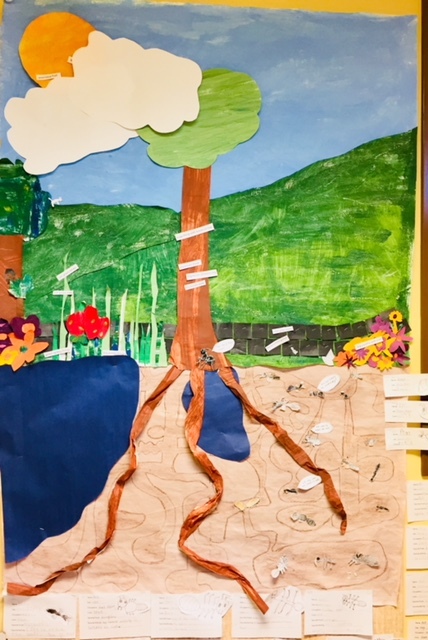 Students researched his art techniques, listened to his stories and did extension activities based on Oregon’s ELP standards. The students were excited to meet so many characters from the stories in their Eric Carl world (see picture of frieze below). This entry was posted in ELD Storyline, ELD Storyline Example, ELP Standards & Storyline, Frieze on June 22, 2017 by C.Vallerga. 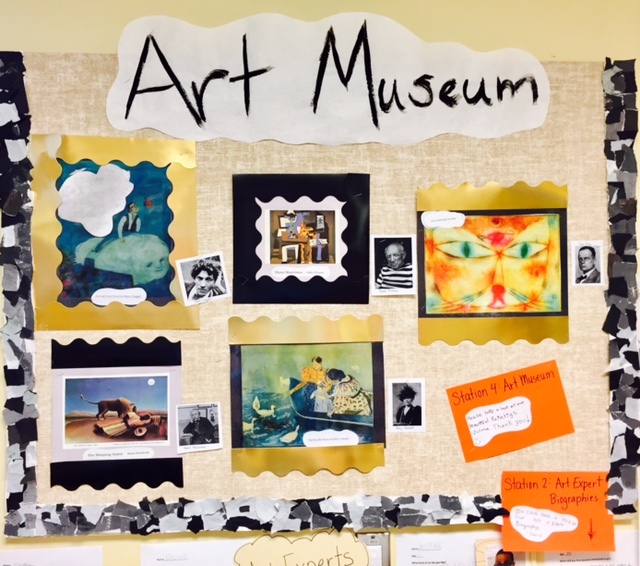 Students in grades 3-5 participated in an ELD Art Museum Storyline. They became art experts and spent time researching, discussing and presenting about the famous works of art in their museum. All 10 of Oregon’s ELP standards were included in this ELD Storyline. 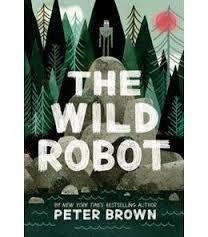 This ELD Storyline is centered around the book The Wild Robot by Peter Brown. The book tells the story of a robot named Roz who is marooned on a wild, rocky island after the cargo ship that was carrying her sinks. The students create robot characters who also are shipwrecked on the island. As the author of the story shares Roz’s adventures on the island, the students share their robots’ experiences on the island as well. 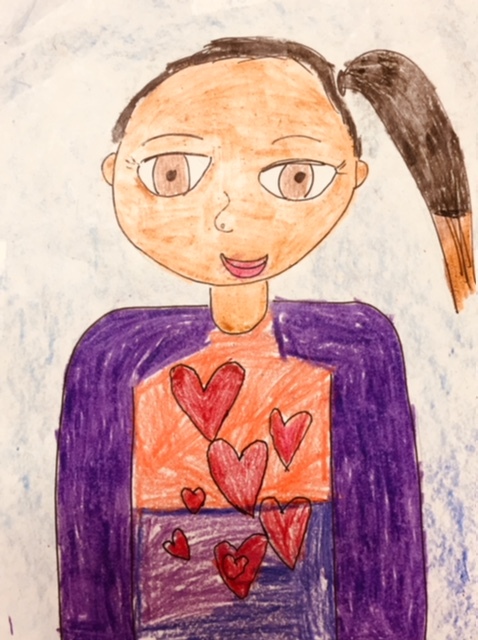 Students do research, which includes interacting with a real robot, drama activities, and many oral and written responses based on Oregon’s 10 ELP standards. We had fun with our robot adventures! This entry was posted in ELD Storyline, ELD Storyline Example, ELP Standards & Storyline, Frieze, General and tagged ELD Storyline on December 31, 2016 by C.Vallerga. I adapted this Storyline for ELD from one written by the Global Storyline Project in Glasgow, Scotland. It tells the story of a giant who wants to fit in with the residents of the nearby village. It’s a drama-based Storyline, meaning the drama drives the story. 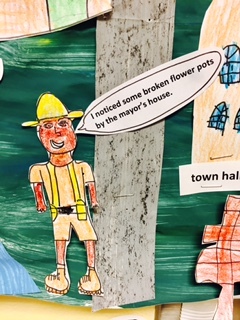 The students participate in the story — and therefore in the drama activities — through the eyes of their village characters (e.g., baker, police officer, etc.). 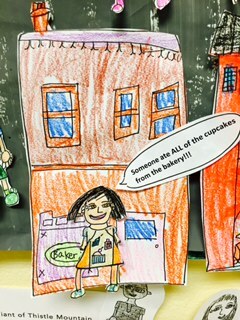 When different incidents occur (for example, when the giant eats all the baker’s cupcakes) the students respond to the incidents by doing a drama activity while role-playing as their village characters. All 10 ELP standards are covered in this ELD Storyline. This entry was posted in ELD Storyline, ELD Storyline Example, ELP Standards & Storyline, Frieze, General, Storyline Characters and tagged ELD Storyline on December 27, 2016 by C.Vallerga. During this ELD Storyline, third through fifth graders became pyramid builders for eight weeks. 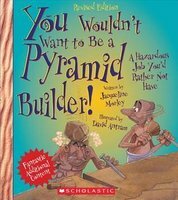 It was based loosely on the book, You Wouldn’t Want to be a Pyramid Builder!, by Jacqueline Morley. 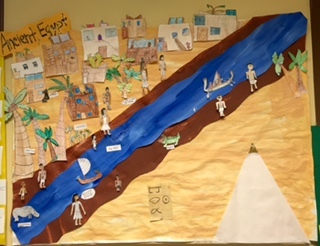 The students did an in-depth research project on daily life in Ancient Egypt, responded to many incidents and participated in discussions (along with many other activities). All of Oregon’s 10 ELP standards were included in this ELD Storyline. This entry was posted in ELD Storyline, ELD Storyline Example, ELP Standards & Storyline, Frieze, General and tagged ELD Storyline on August 12, 2016 by C.Vallerga.